Tis the farmers market season for garlic scapes! If you have visited the Whistler Farmers Market once or twice, I'm sure you have seen one of our dedicated farmers showcasing these at their booth (check out this article to learn about our farmers and what produce they bring each week). Garlic scapes are the flower bud of the garlic plant. The farmer tends to remove the bud in late June to encourage the bulbs to thicken up. Scapes taste just like garlic, and guess what? They can be used exactly the same way as garlic in your favourite recipe! Ring the alarm, break out Grandma's cookbook and get in the kitchen! Garlic buds are actually really good eaten raw. Next time try chopping them up and adding them to a salad. If you're a true garlic lover, we recommend grilling them on the BBQ and using them as a side dish to your favourite meal. Check out some of these recipes that feature the ever elusive garlic scape! In a small, dry pan set over very low heat, lightly toast the pine nuts, stirring or tossing occasionally until just beginning to brown, about 2-3 minutes. Remove from the heat and let cool for a few minutes. Combine the scapes, pine nuts, lemon juice and zest, salt, and pepper in the bowl of a food processor fitted with the blade attachment. Pulse about 20 times, until well combined. Pour in the olive oil slowly through the feed tube while the motor is running. When the oil is incorporated, transfer the pesto to a bowl and stir in the grated cheese. If you plan to freeze the pesto, wait to add the cheese until after you've defrosted it. Pour stock into a saucepan and bring to a boil. Reduce heat to keep hot. Meanwhile, in a large saute pan, cook the onion in 3 Tbsp. of olive oil until translucent and tender. Season with salt and pepper. Add the orzo and mix thoroughly. Gradually add the stock to the pasta, one ladle full at a time, stirring each continuously, until the stock is absorbed and then adding another ladle full. Continue this process until the orzo is cooked to al dente. While the orzo is cooking, in a separate saute pan, heat 2 Tbsp. of olive oil and sear the mushrooms and garlic scapes until golden brown. Add 2 Tbsp. of the butter and a pinch of salt and freshly ground pepper. Let the butter become golden brown, then remove from heat and reserve. Once the orzo is cooked, stir in the remaining 2 Tbsp. of butter, Parmesan cheese and heavy cream. Stir to combine and then stir in the baby arugula and cook just until the arugula is wilted. Taste and add additional salt and pepper, if necessary. Return the mushrooms to a hot burner briefly to re-warm. 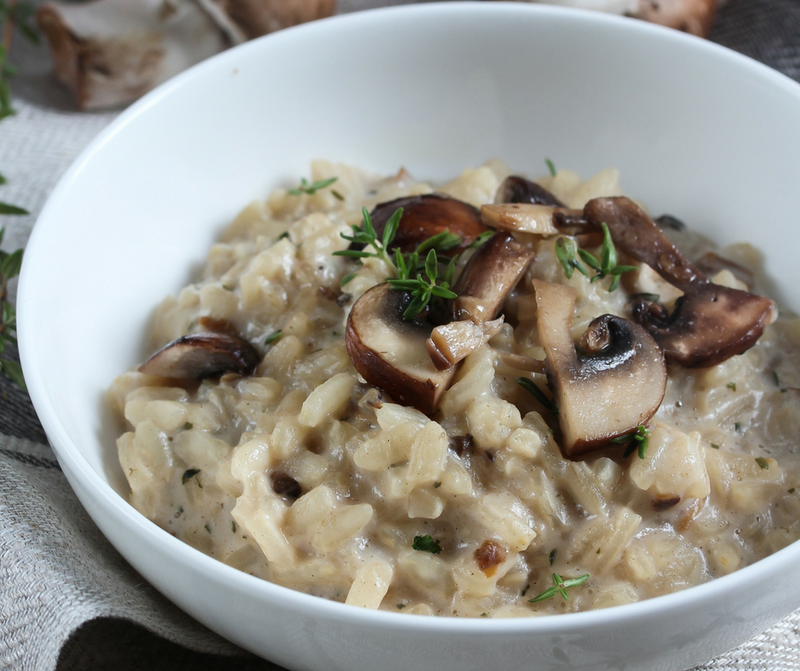 To serve, spoon orzo into a shallow bowl and place a spoonful of the mushrooms and scapes over the top. Using a vegetable peeler, shave some additional Parmesan cheese on to the top for garnish. If you like a smooth dressing, grab a medium bowl and mash the blue cheese into the mayonnaise with the back of a fork. If a chunky dressing is preferred, keep the blue cheese aside and proceed to step 2. Mix the mayonnaise with the sour cream, most of the buttermilk, and all of the vinegar and honey. Add the chives to the bowl, along with the blue cheese, if making the chunkier style. Fold to combine, and season with pepper. Taste for seasoning, adding more buttermilk, vinegar, honey and pepper, as necessary. You can use the dressing right away but I think it's even nicer after a day in the fridge, which gives the flavours a chance to round out. The dressing will thicken as it sits, but can be thinned with a few drops of water. Serve with a dash of hot sauce. 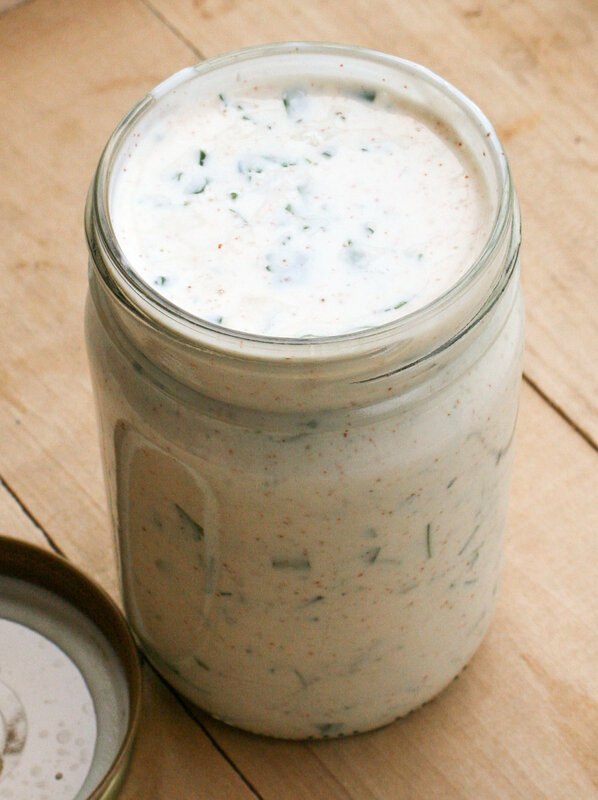 Keep any leftover dressing in an airtight container in the fridge, and use up in a few days.